Sam Oldham is an English artistic gymnast representing Great Britain. He was a member of the British men’s team during the 2012 Summer Olympics . The team won a bronze medal during the competition. He is also a three-time junior European champion and won individual horizontal bar gold at the 2010 Summer Youth Olympics in Singapore. Oldham participated the 2010 Senior World Champions in Rotterdam as a reserve gymnast. He was the youngest member on the British men’s team unfortunately he didn’t’ take part. The British team qualified for the final and finished seventh in the team all-around. In 2011, Oldham was included in the British squad travelling to Berlin, Germany for the 2011 European Men’s Artistic Gymnastics Championship taking place from the 6 to the 10th April. He was once again the youngest member of the team representing Great Britain. He qualified as the second reserve for the parallel bars final, and fourth place for the final on the horizontal bar this was his first major senior final. Oldham was supposed to have been part of the British squad at the London Prepares Series Gymnastics Olympic Qualifier in January 2012, unfortunately he missed out due to breaking his collarbone prior to the 2011 World Artistic Gymnastics Championships in October 2011, and further injuring himself during the competition. Despite him being out of the competition, the British team secured qualification to the gymnastics events at the 2012 Summer Olympics. Even with his injury setback, Oldham ended his first year of his senior career by winning all-around silver at the British National Championships , which doubled as the final selection trial for the Olympic Games. Oldham was pleased with his performance, he said it was “better than I could ever have hoped for”. He was named for the British squad for the Olympics. 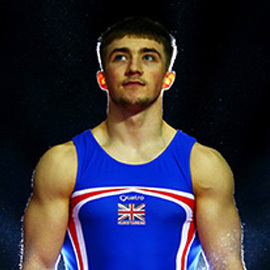 At just 19, Sam Oldham was the youngest member to be named to the British team for gymnastics at the 2012 Summer Olympics , he won a bronze medal in the men’s team all-around final at the North Greenwich Arena on 30 July. During the 19-25 May 2014 at the European Championships in Sofia. Oldham along with his teammates went on to win Team Great Britain the silver medal with Russia ahead. Oldham won the silver medal in high bar behind the 2012 Olympic champion Epke Zonderland. He suffered from ankle ligament damage at the Commonwealth Games in July 2014 but despite this he returned to competition just nine months later. He was third overall in the all-around and won the floor exercise in the final trial for the Olympics, he was unsuccessful in making the 2016 Summer Olympics in Rio de Janeiro. To book Sam Oldham as the Olympic speaker for your corporate event, function or conference with the Champions Olympic agency, simply contact us by filling in our online contact form. Alternatively, call one of our booking agents directly on +44 1509 85 29 27.